A young child describes what it is like to be a migrant as she and her father travel north toward the U.S. border. They travel mostly on the roof of a train known as The Beast, but the little girl doesn't know where they are going. She counts the animals by the road, the clouds in the sky, the stars. Sometimes she sees soldiers. She sleeps, dreaming that she is always on the move, although sometimes they are forced to stop and her father has to earn more money before they can continue their journey. 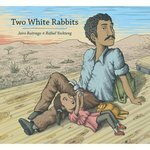 Buitrago, Jairo and Amado, Elisa, "Two White Rabbits" (2015). DIVerse Families. 657.